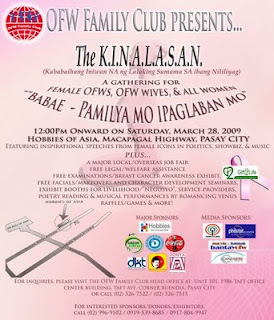 You are all invited to the KINALASAN (Kababaihang Iniwan na ng mga Lalaking Sumama sa Ibang Nililiyag) event being presented by the OFW Family Club (OFWFC) on Saturday, March 28, 2009 at Hobbies of Asia, Macapagal Highway, Pasay City. This event will commemorate International Women's Month and the support group under the umbrella of the OFWFC by the same name. Activities for this 1-day affair will include inspirational talks by female icons in diverse industries (Rep. Connie Dy, Rep. Liza Maza, Susan "Toots" Ople, Gaby Dela Merced, et al. ), a major overseas/local job fair, medical/dental mission, free makeovers, games/raffles, music and poetry by Romancing Venus & much more! Admission is FREE and anyone can attend for as long as they would like to show their support for the abandoned OFW wives, female OFWs, and women in general.